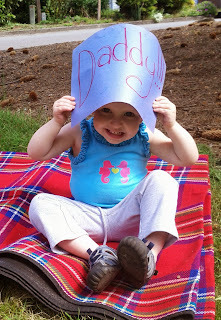 I posted my fathers' day message yesterday, but the kids had a message they wanted to add. We love you, Daddy! You are the best daddy we could ask for. Here is a sneak preview of the talk I'm giving in church tomorrow for fathers' day. Todd, you can go ahead and read it now, since you know sitting alone with the kids in sacrament meeting you will be lucky to hear a single word. When I met my husband, he had recently returned from his mission, and was serving as second counselor in our ward’s elder’s quorum presidency. I was 18 years old, newly arrived at college, and had no thought of marriage any time in the next five years, at least. Todd pretended to play along with my “let’s just be friends” scheme for a couple of months as long as we were frequently together. On my mom’s advice, I got a job working long hours at a nursing home to try to deter him, but Todd realized that the nursing home was in a really terrifying part of town, and refused to let me walk home from my late shifts in the dark. In the end this probably just led to more time together. He pressed steadily on, trying to impress me with some really terrible (I mean sweet) poetry, and his best romantic views of the Tucson skyline. One time, after this had gone on for several weeks, we were watching a movie at Todd’s sister’s house with his sister and her roommates, when Todd got a call from someone in our ward asking for a blessing for a family member. He unceremoniously left me at his sister’s house with a group of people I barely knew for what felt like a really long time. When he FINALLY came back, looking harried and exhausted, I looked at him, and, probably for the first time, thought, “This is a man I could marry.” I saw then that he was a person who was willing to drop anything, to make any sacrifice, to honor his commitment to represent Jesus Christ as a priesthood holder. “...a man whose heart did swell with thanksgiving to his God, for the many privileges and blessings which he bestowed upon his people; a man who did labor exceedingly for the awelfare and safety of his people. On this fathers’ day, it is the men who aspire to these qualities: faith, humility, hard work, and willingness to sacrifice anything in the cause of Christ to whom I would like to pay particular tribute as I discuss the blessings of the priesthood. Although my own father wasn’t present for many of my formative years, I have always been blessed with wonderful examples of worthy, humble priesthood holders. My grandfather, uncles, home teachers, youth leaders, bishops, seminary teachers, neighbors, and even some high school teachers, have been willing to bless and serve me and my family, even when it was inconvenient. As they have humbly tried to do what Christ would do, their abilities have been magnified, their weaknesses diminished, and we have all been strengthened together. Simple answer: The power of God. The power by which the worlds were created. The power that governs the earth. The “divine authority” of the priesthood must be conferred through the physical act of placing the hands of one who has authority on the head of the person designated to receive that authority. The Aaronic priesthood spoken of in the Old and New Testaments was restored to the earth in the spring of 1829 when a resurrected John the Baptist appeared to the prophet Joseph Smith and Oliver Cowdrey and physically placed his hands upon their heads to confer that authority. With the Aaronic priesthood, young men in the church have the authority to bless and pass the sacrament, just as Jesus did when he was on the earth, both in Jerusalem and in the Americas, as we learn in the New Testament and the Book of Mormon. Aaronic priesthood holders also have duties to teach, baptize, and administer in the temporal affairs of the church. Worthy young men can receive the Aaronic priesthood when they are 12 years old. The Melchizedek priesthood, called in scripture the “greater priesthood,” (D&C 107:3) was also restored to the earth in May of 1829, when Peter, James, and John appeared to Joseph Smith and Oliver Cowdrey, and conferred the Melchizedek priesthood upon them by the laying on of hands. In Doctrine and Covenants 84: 19-21 this priesthood is described: “And this greater apriesthood administereth the gospel and holdeth the bkey of the cmysteries of the kingdom, even the key of the dknowledge of God. 20 Therefore, in the aordinances thereof, the power of bgodlinessis manifest. The ordinances necessary for salvation are administered through the Melchizedek priesthood, and a man must be a Melchizedek priesthood holder in order to enter the holy temple and be sealed to his family for time and all eternity. Under the authority of the Melchizedek priesthood, the church is governed. Melchizedek priesthood holders, with authorization from presiding priesthood leaders, can confer the gift of the Holy Ghost. Blessings of healing, comfort, and guidance are available to all through the power of the Melchizedek priesthood. I am deeply grateful that Heavenly Father has mercifully entrusted His divine authority to mankind in this generation. I have been blessed beyond measure by the opportunity to participate in ordinances of salvation administered through the priesthood. Through this priesthood power, my family has been sealed together for time and all eternity. Through priesthood power, I have received blessings of comfort, guidance, and healing at different times in my life. I know that the words of those cherished blessings were inspired by a loving Heavenly Father. These blessings are available to all people. A mistake frequently made by individuals outside of our church, and unfortunately, occasionally made by members of the church, is mistaking the authority of the priesthood for “dominion.” Priesthood holders receive the priesthood for the express purpose of doing the work of Jesus Christ on the earth, and acting as his representatives in teaching and providing the blessings and ordinances that He would provide if He were present. While it is true that priesthood responsibilities include presiding over the auxiliaries of the church, Heavenly Father does not authorize abuse of His power. “ ... the arights of the priesthood are inseparably connected with the powers of heaven, and that the powers of heaven cannot be bcontrolled nor handled only upon the cprinciples of righteousness. 38 Behold, ere he is aware, he is left unto himself, to akickagainst the pricks, to bpersecute the saints, and to cfight against God. The revelation continues in verses 41-44 with a description of appropriate use of the priesthood, and qualities sought by worthy priesthood holders, in language reminiscent of the verses describing Moroni that I read a few minutes ago. I don’t think that that could be more clear. Gentleness, meekness, humility, and love are necessary to exercise priesthood power. To represent Jesus Christ, a person must emulate his qualities in every way they know how. Priesthood authority cannot be used for personal advancement, and holding an office in the priesthood does not place any man above another person. Similarly, that men hold the priesthood does NOT make the role of women less important than the role of men in the eyes of our Heavenly Father. It does not indicate that women of the church hold a position that is in any way second class. “In our Heavenly Father’s great priesthood-endowed plan, men have the unique responsibility to administer the priesthood, but they are not the priesthood. Men and women have different but equally valued roles. Just as a woman cannot conceive a child without a man, so a man cannot fully exercise the power of the priesthood to establish an eternal family without a woman. In other words, in the eternal perspective, both the procreative power and the priesthood power are shared by husband and wife. And as husband and wife, a man and a woman should strive to follow our Heavenly Father. The Christian virtues of love, humility, and patience should be their focus as they seek the blessings of the priesthood in their lives and for their family. Single women also participate in partnership with the priesthood leadership of the church through ward councils. Our Heavenly Father is perfectly merciful. This is obvious because he has provided the priesthood to allow us imperfect beings to receive ordinances and blessings through His power. He is also perfectly just, withholding the blessings of the priesthood from no person who honestly seeks them. Through the priesthood, every person on earth has the possibility of qualifying to be with their family for eternity, and to live with our Heavenly Father. “The same priesthood power that created worlds, galaxies, and the universe can and should be part of our lives to succor, strengthen, and bless our families, our friends, and our neighbors—in other words, to do the things that the Savior would do if He were ministering among us today. I honor you men who are willing to make any sacrifice to represent Jesus Christ- whether it be sacrificing your time for a demanding calling in the church, leaving your family on Christmas day to help give a blessing to my sick child, or arriving at church early week after week to help prepare the sacrament. All of you fathers, grandfathers, future fathers, faithful home teachers, and humble representatives of Jesus Christ, thank you. I would like to close with a verse of scripture about the blessings of the priesthood. I have loved this verse from the very first time I read it, both for the simple truth that it teaches, and because it reads like poetry. T-minus 19 hours until delivery. How is that for prepared? Benjamin woke up this morning congested, so he wasn't a big fan of lying on the floor to play. 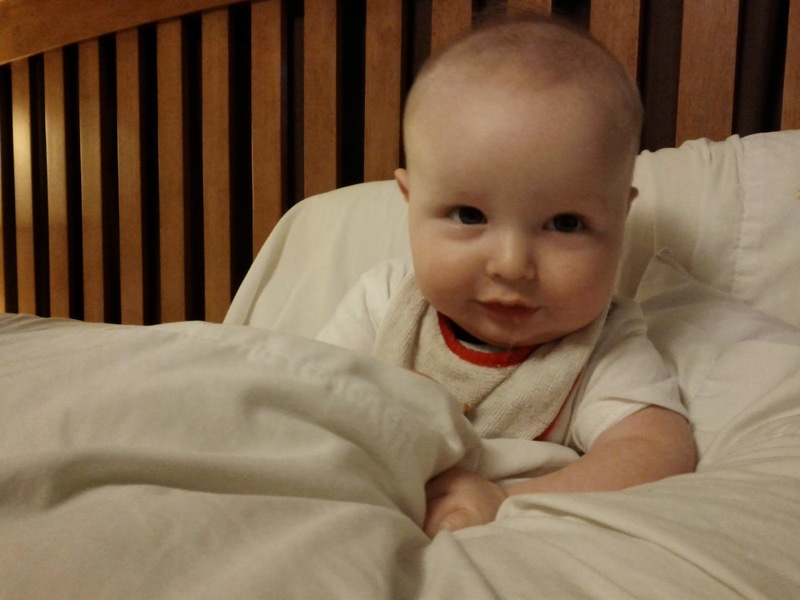 I propped him up on my bed with pillows while I got dressed. Eloise saw him and wanted to climb up, too, so that she could "Be-tend seep" (Pretend sleep). Of course this resulted in the need for additional pillows, since Benjamin was using mine. 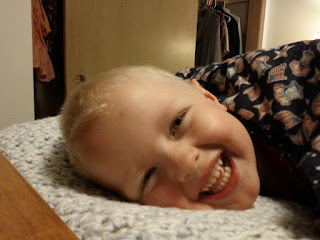 Then Jared joined in, so there was a kicking fight under the blanket, which B thought was uproariously funny. Jared thought so, too. Jared's nose is running like crazy, too. I hope this congestion moves on without doing any more damage. I'm glad my sneezy little guys are still smiling. 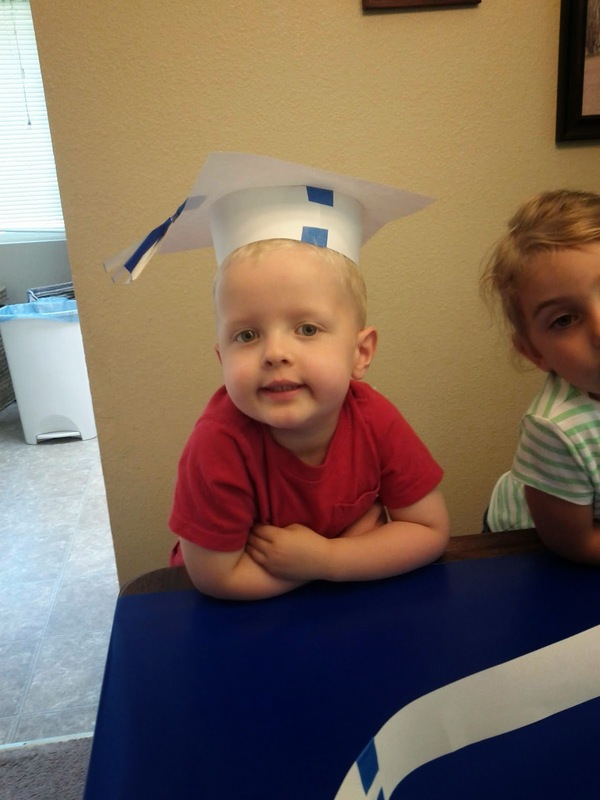 Last Friday was the last day of Jared's preschool for the school year. 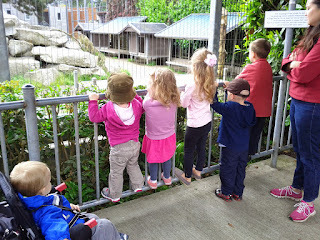 Since the kids learned the letter Z for their last week, the final day was a field trip to the zoo. 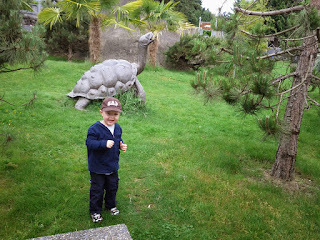 We went to the Cougar Mountain Zoo in Issaquah. 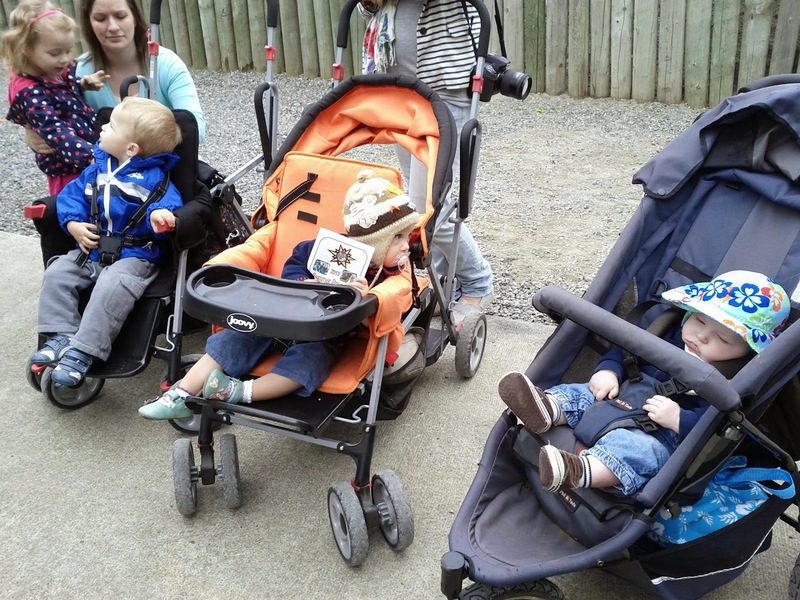 I had heard it was a little bit smaller and more manageable for small kids than the Woodland Park Zoo. The cost of admission is a little high for the size of the zoo, but it was more the right size for these kids. Baby line! Mason is 18 months, Evelyn is 14 months, and Benjamin is 6 months old. B was the only one to fall asleep in the zoo. Possibly my favorite thing about the zoo was the sign above the tiger cage warning that tigers can pee up to 20 feet. 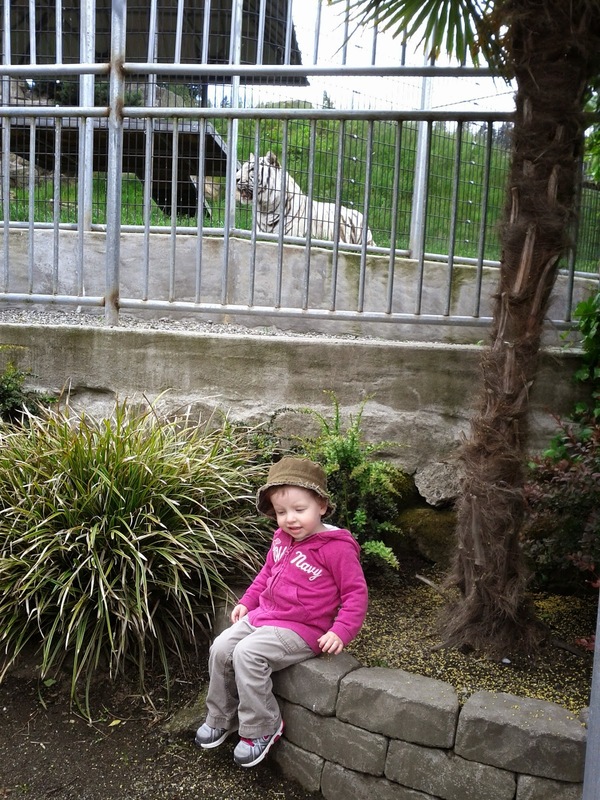 You can stand much closer to the tigers than that. 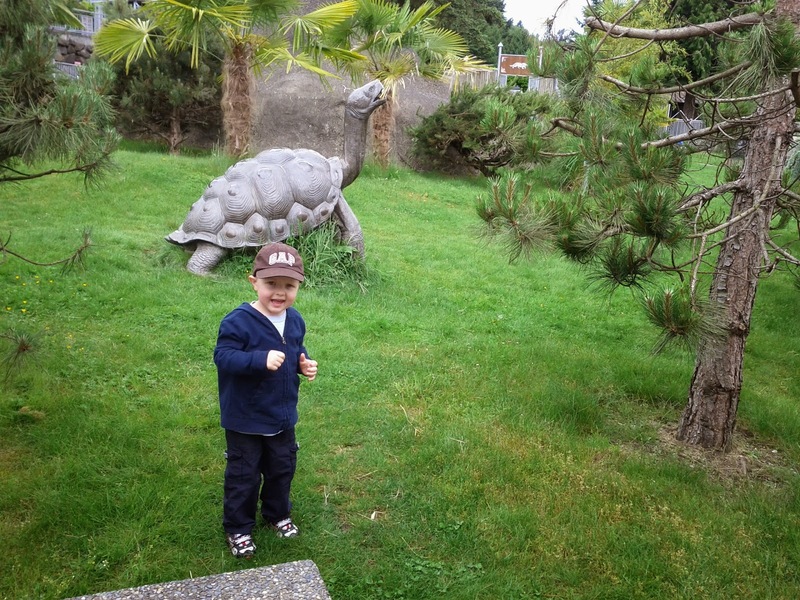 Cougar Mountain Zoo also boasts the largest collection of life sized bronze animal statuary in the country. They probably have more bronze than real animals. By the time we got to the reindeer exhibit, I felt like a vending machine. My kids asked for snacks any time they saw anyone (human or animal) getting fed. The children were also pretty tired. 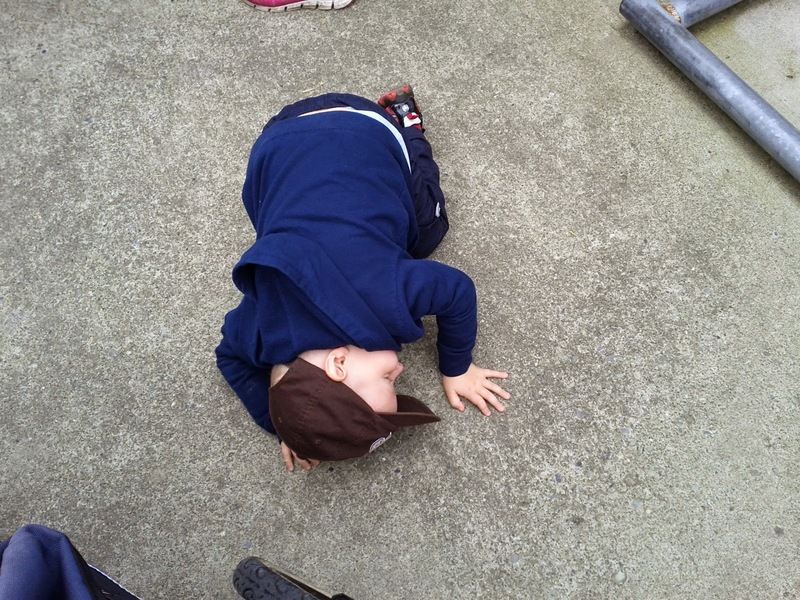 I found Jared lying on the ground at one point, so I decided it was time for lunch. 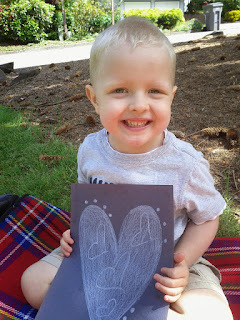 After lunch with friends, and about eight potty trips (not exaggerating), we headed home. 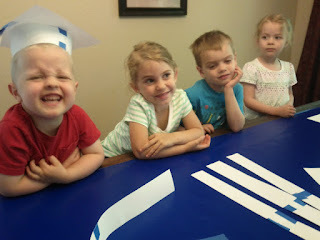 Because we ran out of alphabet letters, preschool is over for the year. 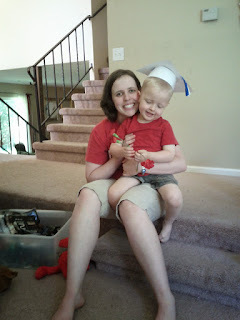 One of the moms decided to have a little preschool graduation ceremony/ play date at her house. We started with a craft; making these graduation caps. All of the graduates: Jared, Ashlyn, Jason, and Lucy. Jason and Ashlyn are turning five this summer. I'm so proud of my growing up boy! Todd: Jared! Where does Mommy keep the vacuum cleaner? Jared: It's the purple thing. Me: Is Mommy a boy, too? Eloise: No. Mommy's a superhero! 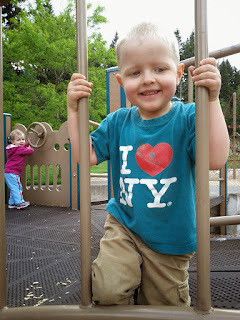 Here are some real smiles from the munchkins on the playground for your enjoyment. These pictures were taken on Thursday. 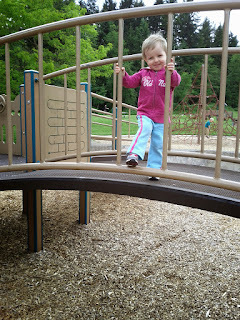 Miss Independent Eloise climbed up a ladder that she got herself stranded on last time we were at Big Finn Hill Park. 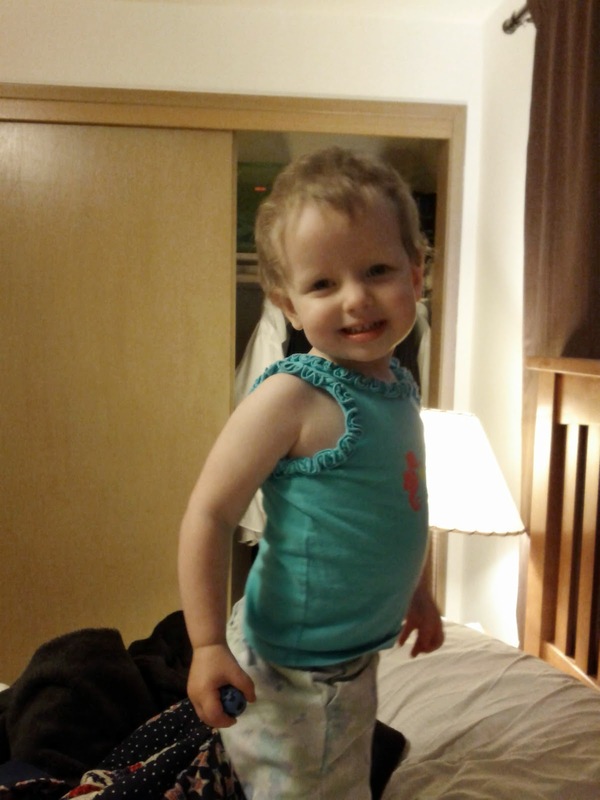 It was all I could do to sit and let her try it on her own. She aced it, of course, but I felt a little bit like I lost something. 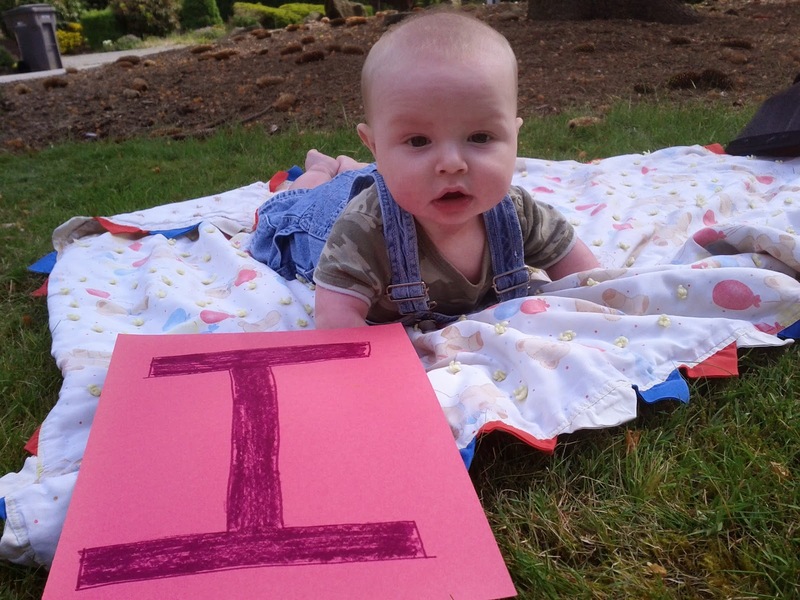 There is one less thing in the world that this baby needs me for. 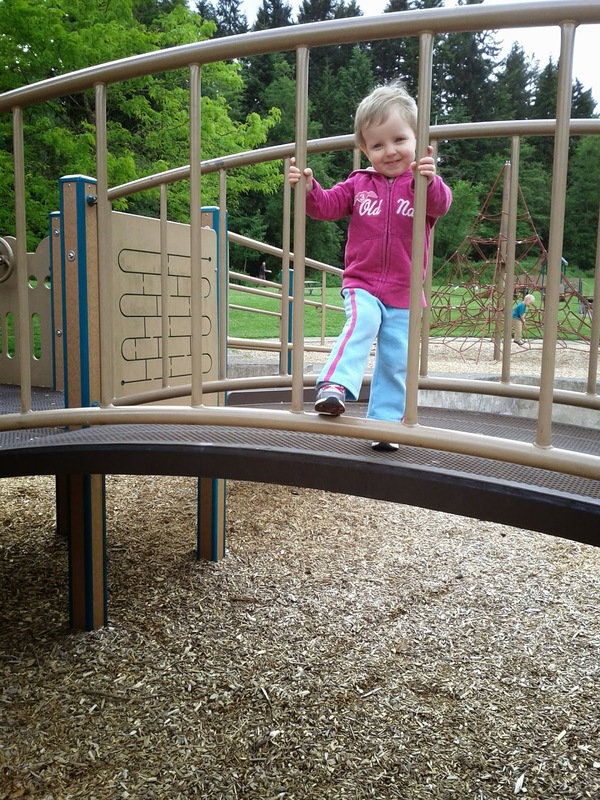 I am a little bit sad to see her growing up and mastering new things so quickly. Three and a half year old Jared is full of an ebullient energy at all times. He doesn't walk anymore; he skips and hops to the rhythm of his enthusiasm. Everything is SO EXCITING!!! 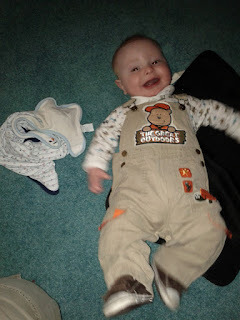 It is really fun (and exhausting) to watch him leap and hop and skip through his days. Today I took Jared with me to pick up some baby portraits of Benjamin that I finally got around to ordering. As we were walking (I was walking, Jared was skip-hop-stop-jogging) through the busy mall, he spotted something inside a store, so he screamed out at the top of his lungs, "AN ESCALATOR!!!" Every eye in the mall was instantly on us. Don't worry. I made sure he got to ride on the escalator. B was also at the playground with us on Thursday, but it was a blustery day, so he was bundled up, and spent the whole time at the playground in my arms. It's hard to take a picture of a baby you are holding. Here is one from earlier in the day. B is starting to be a little wiggler. He loves to be tickled and startled, and he has a smile for everyone. Eloise will put her face close to his and report, "He sees you! Ben-amin 'miled at you!" I love this mixing up pronouns phase, this ebullient phase, and this smiling at everyone phase. I am the happiest mom in the world.